There is no kitchen more timeless than the Shaker style,with its simple lines of the frame and panel in the cabinetry and the quality of materials used. It's a look of craftsmanship and over the years has varied slightly for contemporary tastes but still has that classic feel lending itself to any age of house and any style from on-trend industrial to country cottage. If you like to both cook and entertain, a Shaker style kitchen is an excellent choice and will work in any room layout. When designing your space, here are some ideas for a Shaker kitchen that will be both functional and sociable. 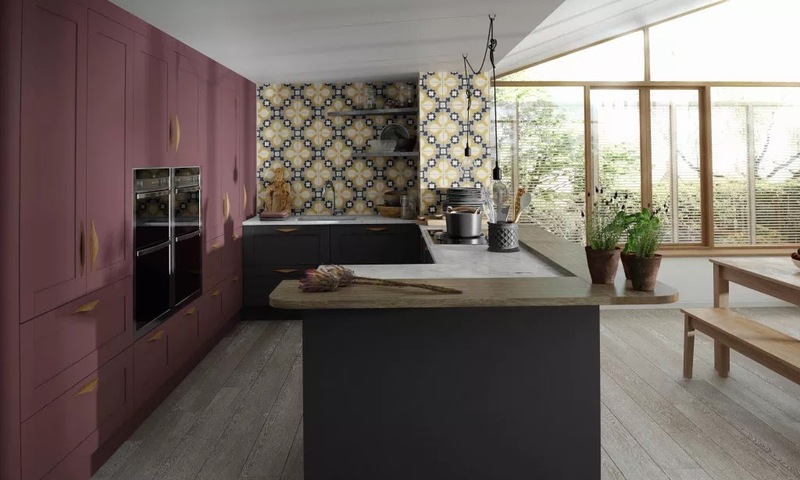 A Central island or breakfast bar is an ideal option for creating a kitchen where friends and family can gather round, for glugs of wine and laughter whilst also busy preparing the food. 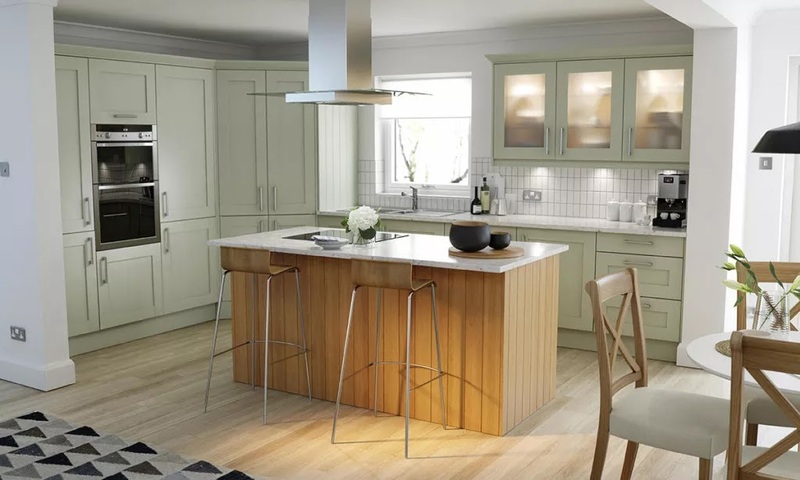 In the Shaker style, a central island is a stylish addition showing off its simple clean look, creating space for people to sit, workspace for food preparation and extra storage. A different wood finish to the rest of the kitchen can be a great contrast and creates an inviting space. An increasingly popular trend is for open plan living that makes a home light and airy. Multi-functional rooms that are kitchen/diners and family rooms will become the heart of the home. So much better to be able to cook in the kitchen and not feel cut off in a separate room whilst everybody else is chatting elsewhere. A shaker kitchen is a versatile solution for open plan free flowing spaces with its endless possibilities of unit options and finishes; white gloss, greys, sage green or indeed any colour you desire. Being able to create a tailored kitchen makes it easy to combine with all the other elements of an open plan space, mixing old and new. Paint the dining table and chairs in chalky pastels for a pretty country vintage look or have a pared back look with exposed brick and metallic elements. For summer living a kitchen space that flows into the garden brings light into the home and the current trend for bi-fold doors creates a contemporary seamless link from indoors to outdoors. The clean lines of Shaker style works well in this arrangement adding to the fresh feel and wonderful views of the garden whilst cooking and even on rainy days it will feel a brighter space. For busy family lifestyles, children running in and out, barbecues, outside dining and parties, it is a well thought out design that uses the classic appeal of Shaker to blend garden and kitchen together. Every good cook needs ample room for storage, where else to put all those gadgets and equipment for everything from baking your cakes to all your pretty dinner party tableware. 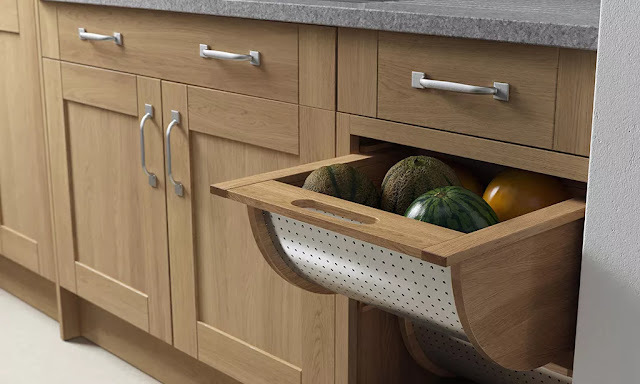 The solidity of Shaker units allows for tall units integrating cupboards, clever vegetable storage or deep drawers but still with a streamlined minimalistic feel. Don't forget the shelves too for all your recipe books! Smart storage solutions and quality bespoke design that will last and last. Add some glamour. Create a talking point among guests with a stunning light fitting or an eye catching splashback. Paired with Shaker style, they will compliment each other beautifully. A fresh spin on the classic look, perhaps a bit of bling with a chandelier, rustic charm with copper ceiling lights or some geometric tiling. Above all the Shaker kitchen style is welcoming and homely, a great investment and iconic with a timeless feel.